German sisters Joana and Leonie Schneider make even the most mundane of things (such as drinking forties) wonderful in their songs. As you can probably tell, we've grown a little obsessed with a group of girls around the New York area who are making music in a similar vein of each other but still remain unique in their personal projects. First, we wrote about Frankie Cosmos – her vast yet stellar discography and her desire for Little Debbie's Cosmic Brownies. Then we covered Whatever, Dad's maybe later and how Elaiza's hushed and beautiful acoustic pieces especially resonated during our own personal life slumps. This time we bring you DC Schenider, who came to me via the recommendation of Greta of Frankie Cosmos. Greta described them as "crazy beautiful weird experimental folk disco craziness", and after listening to their music, I have to agree. DC Schneider is the moniker for Leonie and Joana Schenider, two sisters who originally come from across the Atlantic Ocean (Germany, to be more specific) but appear to be sometimes-based in New York City. The sisters have been steadily self-releasing music since August of 2012 and switch off from recording together and by themselves – you can tell based on who the album artist is (DCL or DCJ) and whose photoshopped photobooth picture is used as the album art. For example, the April DC Schneider album, leopard, is credited to DCJ and features a picture of Joana over an awesome leopard print background. leopard is full of sweet, straightforward songs with names like "My Sister is Cool" and "Pancake Day" that revolve around simple keyboard beats and Joana's vocals. The songs are accessible but not fluffy – their music isn't something anyone with a Casiotone could do. 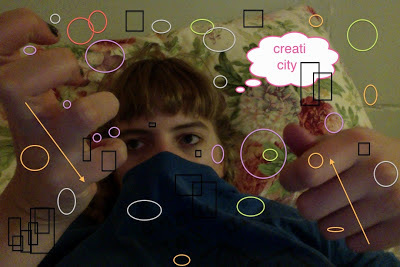 Creaticity is the most recent release on the Schneider sisters' bandcamp, but this time it's Leonie going solo (note the picture with circles and squares expertly drawn over Leonie's face). Creaticity diverges from the direction leopard took and instead has a slightly more experimental and at times grim feel to it. Instead of playing a keyboard, Leonie uses only an acoustic guitar and her voice to construct the music on Creaticity. The album begins with the song that's simply titled "40 song", which is about, as you could have guessed, drinking forties. A trait that I admire in the Schneider's music (as well as Frankie Cosmo's) is the ability to turn these seemingly unimportant everyday items or moments or sayings into the subjects for beautiful and poetic songs. For example, on one of the less conventionally-structured tracks on the album, "stalking", Leonie layers her voice singing "sorry I'm not sorry" over aggressive strums of her guitar, making a saying I once hated it something both haunting and fascinating. The songs on Creaticity oscillate between a jumble of similar feelings – some edge towards a musically dark place of Leonie's mind such as "high five - hug", which is an instrumentally minimalist and tense song about giving high fives. But others such as "TRAIN" and "may poem" employ some melancholy but more importantly remind the listener of how easily beauty can be created in music and just generally found in life. The Schneider sisters can get serious but they also know when to get silly, which is what I adore about them. The Schneider sisters will be on tour with Frankie Cosmos in Germany this summer so our German readers should absolutely go see them. For now, we'll just have to wait patiently until they're stateside again. Listen to more DC Schneider on bandcamp.